A32 Industrial V-Belt. MTD Belt 754-0193. Superior replacement V-Belt. 1/2” Wide, 34” Length. Home > Heavy Duty V Belts > Moulded Notch V-Belts. AX, BX, CX, 3VX and 5VX Sections. > AX Series. 1/2" Wide Molded Notch V-Belts > AX32 Molded Notch V-BELT > A32 Industrial V-Belt. Superior replacement V-Belt. 1/2” Wide, 34” Length. A32 Replacement V-Belt. 1/2" (13mm) Wide, 34" (834mm) Length. RMA certified to resist heat, oil, and static. Heavy duty V-Belt for multiple uses: Snow Blower/Snow Throwers, Lawn & Garden, HVAC Fans-Blower-Refrigeration Motors, Go Karts, Industrial Power Transmission. Suitable for all industrial applications, including v-flat drives. A32KC Belt. UltraPower AG V-Belt (Kevlar Covered). 1/2" Wide, 34” Length OC (KEVLAR). 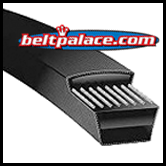 Replaces Standard Raw edge A32, 4L340 FHP V-Belts. A33 replacement V-Belt. 1/2" Wide, 35" Length. RMA certified to resist heat, oil, and static. Heavy duty V-Belt for multiple uses: Snow Blower/Snow Throwers, Lawn & Garden, Fans-Blower Motors, Go Karts, Industrial Power Transmission.